Southern Arizona is getting a little fed up with politics in Phoenix—and rekindling the quest for the 51st state. 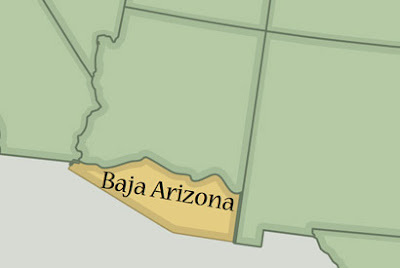 Call it "South Arizona" or "Baja Arizona," the idea is the same—splitting off the more liberal south from the more conservative north. In the last few days, a new committee has been formally created in Pima county, and leaders are working to get the topic on the ballot for the next election. Like most statehood proposals, this isn't a new idea—I documented past efforts in Lost States. While cleaving the 51st state from Arizona seems unlikely... so did ousting Hosni Mubarak. And you'd think the folks in the north would love this idea, since adding a "buffer state" would mean they'd no longer have a border with Mexico (kind of like the imagined Southwest of the infamous Peggy West). Read more in the Tucson Citizen or KOLD-TV.